Few home improvement projects demonstrate the fact that just because a homeowner can do a project by themselves doesn't mean they should as well as house painting. Hiring a home painter anywhere in the country isn't cheap and San Antonio home painters are no different, but by the time you buy the paint, the supplies, and take the time to move furniture, tape all edging, and lay down plastic, you may look back and realize the estimate the painter had given you was more than reasonable. Besides the convenience, San Antonio home painters can many times do a better job. They paint for a living and know how to hit those hard corners and keep a straight edge as they go. Not only do they promise quality conventional paint jobs, many companies also offer specialty painting services. Textured painting techniques, murals or trompe loeil, or faux finishing are all distinctive painting techniques that are beyond the ability of many homeowners. When looking for painting contractors, San Antonio is not a bad place to be. Not only are there plenty of San Antonio painting contractors to choose from, there are also several ways to find them. The local phonebook is an obvious place to start, but an ad in the phonebook won't give you much of a clue of how these companies have performed for others. Here's where HomeAdvisor can help. Not only will a request through HomeAdvisor match you with only contractors that have been pre-screened to assure a reputation for good service, you'll also have the chance to read feedback left by homeowners like you who have already used these painting contractors. San Antonio is a big place, and there will be many house painters willing to work for you, but the knowledge you can gain about individual painting companies through HomeAdvisor is something that no phonebook could ever match! Exterior home painting needs to be done about every 5 to 7 years. You don't need to be told that your home's exterior takes a beating every year. Elastomeric paint will last longer and provide a better level of protection. It costs more, of course, but it's often worth it in the long run. 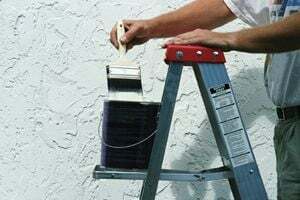 While painting the exterior of a home can take the casual homeowner quite a while between buying the supplies, setting up, and hauling a ladder around the house, a professional San Antonio home painter can have your home painted in a fraction of the time. There's no one painting service, and there's no one price we can give you. We can tell you from all the painting projects we oversee that the national average for a full home interior paint job is just over $2,000 and just a shade under $3,000 for the exterior of your home. The numbers from our San Antonio home painters suggest hiring a professional painter in San Antonio is just a bit cheaper, although specially-formulated paint or larger homes will increase the cost. San Antonio house painters can finish paint jobs quickly and efficiently, but they're not magicians. If they need to move furniture, do extensive paint prep, allow the paint to dry before applying a second coat, etc., it may take a couple days to get your entire home looking the way you want. Exterior home paint projects may take even longer, as the schedule can also be delayed by inclement weather. It's easy to think that you're paying a professional painting company to do a job and your money should be enough to guarantee the quality of your project. This is usually the case, but painters are human, too, and can be susceptible to looking at something as "probably good enough". Be courteous and treat your painters like houseguests, but be sure to inspect the job before you let the painters go. Offering them something to drink and/or snack on can also go a long way toward coaxing your painters into going that extra mile for your home. Also, if the language barrier is an issue, you may want to tell the company you hire that at least someone on the home painting crew needs to speak English or Spanish so you can communicate efficiently. Unfortunately, house painting is a profession where scams pop up every once in a while. Hiring anyone going door to door is always a bad idea, and hiring someone from a flier hung on the doorknob or stuffed under your windshield wipers is just as bad. The fact is, checking up on any company you hire is a necessity in today's world, and this is particularly true when hiring painting contractors. San Antonio is hardly more prone to scams than any other area of the country, but by going through HomeAdvisor, you can get the feedback and information you need without the hassle of multiple phone calls, ensuring that the painting company you hire is not a fly-by-night operation. Comment: Paint two room and remove popcorn ceiling. San Antonio Painting Contractors are rated 4.74 out of 5 based on 2,594 reviews of 166 pros. Not Looking for Painting Contractors in San Antonio, TX?